Residents may put loose leaves on their tree lawns until Friday, May 3rd. After that date, all yard waste needs to be bagged. Be sure to keep brush and ornamental grass separate from leaf piles. Join us for a Rain Barrel Painting Party! The City of Beachwood in partnership with The Friends of Euclid Creek and The Collinwood Rain Barrel Project are sponsoring a Rain Barrel Painting workshop June 1st and 2nd for adults and families. For the price of $60.00 (the cost of the rain barrel alone), anyone can attend a two-day painting workshop conducted by the Collinwood Rain Barrel Project and Friends of Euclid Creek at the Beachwood Public Works Department. Food and live music are included. It's Time to Recycle Cardboard! Beginning Friday, April 13th, 2018, a City representative will be attaching an informational sticker to the lid of your recycling cart. The sticker highlights the recent changes in the City's recycling program. Please refer to the sticker for program changes. 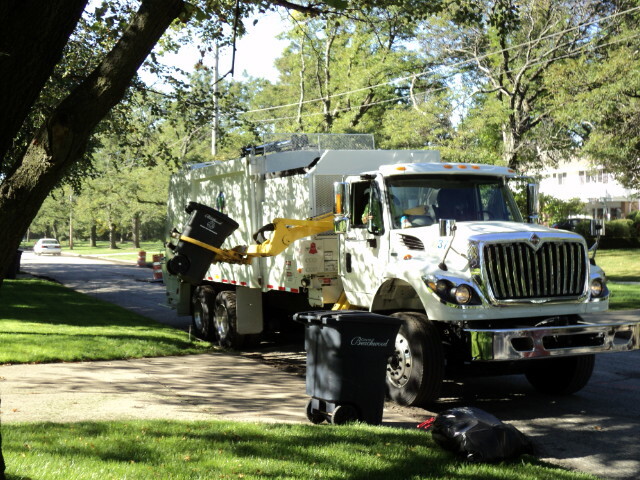 If you have any further questions regarding the recycling changes, consult the Recycling Page in the City's website or contact the Service Department for more detailed information.